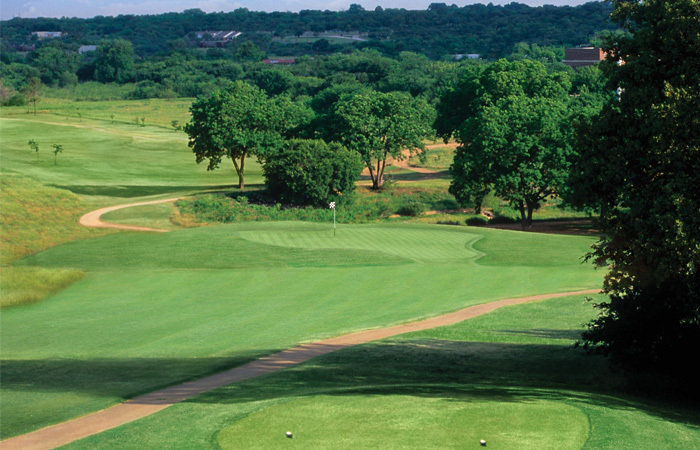 When it comes to municipal golf, there are a multitude of options around the Dallas Fort Worth area. Some of us like to play on a budget. Some like to experience the finer courses around town. Some like a challenge. Some like to tee it up at a spot where you can potentially go low if you’re striping it. And for some, where we play can be fluid. We might play a tough course one week, and then a budget, simpler course the next. Or it could depend on who you’re playing with. Maybe your partner that day wants something easy that won’t break the bank. If you’re having trouble deciding where you should go knock it around, maybe Lake Arlington is the spot for you. It’s a fun municipal course with some chances to score, some great views, all at a price point that won’t leave anyone needing post round beer money. Although Lake Arlington doesn’t have a practice range, there is a net next to the first tee where you can hit a few balls and loosen up (similar to Stevens Park in Dallas). The Lake does have a nice putting green to also roll a few as you get ready for your round. The first hole at The Lake is a dogleg left par 4. If you can carry the large tree at the corner, you shouldn’t be left with anything more than a short iron into the green. The par 3 second hole is one of the more difficult on the front 9. From the back tees, this one plays as much as 180 yards. Water to the left of the green can collect any errant shots that direction, and if you miss right, a brutal kick will leave players with an awkward uphill chip shot from a tight lie. If you are to attack Lake Arlington and go low, no’s 3 through 9 are where you can do some damage. Depending on how aggressive you want to be, you can hit anything from 4-iron to driver on the third. The fairway narrows and there is water on the right, so a driver needs to be pinpoint. Execute, and a wedge approach awaits. Choose to lay back a bit, and you can hit a short iron. Either way, this hole is absolutely gettable. No. 4 is another par 4, and this one is a bombers delight. Straight away with a wide landing area, the longer hitters can challenge the front of the green, and an average tee shot will leave somewhere between a sand wedge and a nine-iron. Birdie is absolutely doable here. The fifth is a bit of an awkward tee shot. A draw is required, so a driver that stays straight ends up in a water hazard at the end of the fairway. If you can cut the corner, you will be in great shape to walk away with a par. No. 6 is the no. 4 handicap on the course. This hole is almost always fighting a cross-wind, and with Pioneer Parkway running along the left, anything with too much hook will end up bouncing alongside traffic. Miss too far right, and some native grass will devour your tee shot and again bring the big number into play. No. 7 is for my money, the most difficult hole on the front nine. From the back tees, an awkward tee box funnels balls through a narrow chute of trees. During the summer when the foliage is thick, the view of the green is partially obscured and makes for an almost blind-ish long-iron shot. If you miss the green left, your ball will kick through a fence OB. The green is deep, so if the pin is in the back, players can add an extra club. Nos 8 and 9 are a pair of holes you can get some strokes back before you head to the more difficult back-nine. No. 8 is a hard dogleg left, but if you can hit a hard draw over the trees, players will be reaching for a scoring club with a chance at birdie. The ninth hole is a green light special for the longer hitters. At just 469, this par 5 plays more like a long par 4. A power fade that catches the right side of the fairway will kick downhill left and leave as little as an 8 or 9 iron for the big hitters. An average tee shot leaves a mid to long iron and a good chance to get home in two. The great equalizer on no. 9 is the undulating green that has some violent breaks depending on where you end up. At Lake Arlington, it’s truly a tale of two nines. The front is relatively flat and straightforward, with some great chances to make some birdies. In fact, if you’re a beginner or someone who loves to walk nine holes to burn up some calories, then it doesn’t get much better than the front at The Lake. As you make the turn, no. 10 is another slight dogleg left par 4. It runs alongside the first and has a similar routing. The main difference between the first and 10th is the green complex. The 10th has an elevated green that has severe slope from back right to front left. Find yourself in the wrong spot and it can be a diabolical two-putt. No. 11 is the most difficult fairway to hit at Lake Arlington. Most choose to hit a three-metal, hybrid, or even an iron to keep this one in the fairway. Left if out-of-bounds, and there is a pond on the right that swallows anything that hits to the right of the cart path. With a well-placed tee shot, a short iron remains to a deep green. If the pin is cut in the back, expect to add at least one club. The stretch of numbers 12, 13 and 14 present the toughest stretch of holes on the course. No 12 is a rolling par four with a pond on the right, and a large swale that runs downhill once you reach the pinnacle of the fairway. A driver here needs to be on the line of the cart path. Anything right of that risks being in deep native grass, and anything left of that line can potentially run through the fairway into the thick grass on the left of the LZ. If you can chase the ball to the bottom of the hill, it leaves a very awkward uphill approach that is hard to stop, especially with a front pin. The better play is to lay back off the tee with an iron or hybrid and leave yourself a good look at the green. Players will still only have a mid or short iron in. The 12th green is one of the quickest from back to front on the course, so beware if you happen to be standing over that putt. No. 13 is the number one handicap on the course and when you play it, you’ll definitely see why. This long, uphill par four dogleg left presents the most challenging driver swing you’ll make all day. The long hitters can try to cut off the corner but pull one and you risk being stymied in the trees or hitting it OB. Miss right, and there is a water hazard hidden among the trees. If you can find the fairway, the second shot plays at least one club uphill, and the pin is often an optical illusion. If the flag is tucked in the back, you can hit an approach that looks to be 10 feet away, only to reach the green and see that it’s 40 feet short. It’s a fun hole, and one that will challenge even the best ball-strikers. When it comes to par 3’s, you won’t find many in the metroplex with a view as good as the one at 14. This par three overlooks Lake Arlington and its dam and plays about 75 feet downhill. Playing about 240 from the tips, over the years, I have seen players hit anything from driver to seven-iron depending on wind and other factors. I even saw an elderly gentleman hit a nine-wood once, and he said he carried it specifically for that hole. Although due to the downhill it looks like you might be able to land the ball short of the putting surface and run one up, be careful, the elevation usually means the ball will crater once it hits and go nowhere. It’s truly one of the most interesting par 3’s in the area. After the interesting par three comes back-to-back par 5’s. No. 15 plays 579 and you carry the Lake Arlington dam spillway off the tee. 16 heads back the other direction and plays 559. Both are pretty wide open, so bang a driver and see what happens. Native areas are in play on both, but you have to stray a good way to find them. Another tough par 3 is the penultimate hole at The Lake. Tipping at just over 200 yards, this one is relatively flat, which always makes for a bit of an interesting club selection. Miss too far right and you will find a meandering creek. A little short and left is your best play if you’re going to miss. The 18th is a shorter par four with a slight dogleg right. A good tee shot will leave nothing more than a wedge and a chance to get back in your car after a three or four finish. One unique thing about Lake Arlington is there are no bunkers on the course, so if you have a beginner who may struggle with sand saves as he/she is learning, this is a perfect place to refine their game before embarking on some tracks with sand everywhere. The clubhouse is clean and well maintained, the snack bar has all the usual suspects. If you need a Powerade, iced tea, or cold beer you’re certainly in luck, and if you need to stock up on nuggets, or need a new pair of kicks before your round, they’ve got you covered. Still not entirely sure if it has even been tamed, but it sure is fun to play. Address: 1516 W. Green Oaks Blvd. Toughest Hole: No. 13, 371-yard par 4. This uphill par four plays much longer than the 371 on the card. Trees and OB left, and a water hazard right make this one a tough driving hole. And the green depth can sneak up on players. An iron shot that looks great when you hit it often times comes up well short if the pin is cut in the back. Favorite Hole: No. 9, 456-yard par 5. A good tee shot here almost assures at worst a par, and the longer hitters will have nothing more than a 7 or 8-iron in. It’s a GREAT opportunity to make a birdie before making the turn to the more difficult back-nine. No. 14, 245-yard par 3. As No. 13 plays longer than the card indicates, this par-three heads back down the hill and plays shorter than it reads. Not to mention the fact that you get a gorgeous view of Lake Arlington from the elevated tee box. It’s a fun hole, and one of the most unique in the area. On February 18th, 2005, Mr. Parlin was on duty as a golf course marshal, watching his son from behind the tree on no. 15. Dale’s son Scott ricocheted a shot off the tree striking his father in the head. He was taken to an area hospital where he passed the following day. Lake Arlington carries on his memory with the sign on the tree, which was originally wood, but weather took its toll and the sign was replaced with a metal one earlier this year. If you play The Lake, take a moment to stop on no. 15 and pay your respects.